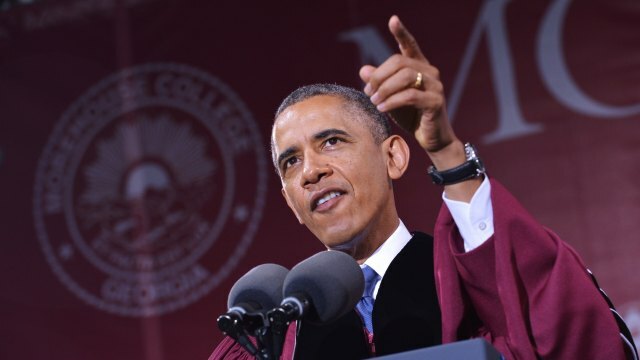 I was debating on whether I should write about President Obama’s commencement address to the graduates at Morehouse. I was absolutely moved to say something until several other articles starting springing up this week discussing issues primarily around the President and the First Lady lecturing African-Americans and speaking condescendingly towards them. The speech that Obama gave was tailored to black males and was intended to prepare for what we are about to face once we enter the “real world”. It also charged us to be men who do not believe in excuses. I would not have wanted Obama to present a speech that he would at any other institution because Morehouse in not just any other institution. As black men we do not need to be “pacified” or “blanketed” from the harsh realities that we will face once we enter work spaces where in some cases there will be no one that looks like us. It’s also fair to add that the speech was a hit amongst the graduates. It’s also fair to say that right before publishing, I came across Jack White’s article on The Root, which questions the harsh criticisms Obama received from Black commentators, and he contends that their comments went too far by challenging the President for sounding like a father figure rather than a politician. I feel bad for adding to the list of editorial pieces about President Obama’s position on Black people and our issues, and I believe all of the scholars, journalists and pundits are brilliant and respectable individuals presenting thought-provoking and insightful opinions. I enjoy reading some of these writers’ thoughts on the daily basis. But, they all seem to have missed an important caveat that they’re either unaware of or don’t support: colonialism and the role it plays in America. I probably would’ve forgotten about it if I didn’t just complete I Mix What I Like: A Mixtape Manifesto by Jared Ball. In the book, Ball analyzes how corporate control of the music industry compares to colonialism. How does this book relate to this discourse? The author provides readers with a general understanding of colonialism first. In order to understand Obama’s–seemingly-allegedly-possibly-maybe-based on some people’s opinions–condescending remarks to the Black college graduates, we must have a basic understanding of colonialism and neocolonialism (the 21st century manifestation of the former) and then learn one key lesson of colonialism. In my own words, colonialism can be defined as the act of an autonomist power taking control of a dependent nation and its land, resources and people. The action has been in existence since the beginning of history, but the concept was popularized in the 19th century. It’s primarily associated with Africa and Europe’s assault on the continent. As mentioned previously, neocolonialism is the 21st century manifestation more covert form of colonialism. Ball makes an interesting and compelling case, arguing that African America is a colony within the United States and that Black people are the colonized. It makes sense considering our history in America under slavery, terrorism and discrimination and our continuous predicament under the current versions of slavery, terrorism and discrimination. It’s also critical to understand that many African-Americans are colonized regardless of affluence. Many are wealthy and/or (mis)educated but are either dependent on mainstream society, to an extent are psychologically enslaved or lack power. Money alone doesn’t equal power. There are many key components of colonialism and lessons to take away from this concept. The single message on colonialism emanating from Obama’s speech and the number of columns and blog posts on “personal responsibility” and “tough love” is what Ball briefly mentions in his book in regards to what happens to any colonized group: “The colonized are blamed for their condition.” It’s a quite simple and concise lesson, but very profound and significant once it’s thoroughly and seriously considered. What the President did in his speech and what many writers and analysts subconsciously danced around was that he blamed the colonized for their condition. Women and gay people are colonized groups as well, and Dr. Watkins is probably correct in his assessment that the President most likely wouldn’t offer the same patronizing tone if he were speaking to the aforementioned groups, but keep in mind that African-Americans and Africans throughout the diaspora are at the very bottom of the colonial pyramid. Like the title of Frantz Fanon’s work on Algeria’s fight against French colonialism, Black people are considered to be the Wretched of the Earth. What makes this a sticky situation is that Obama was speaking to a crowd of young, Black men like myself and the speech could very well be identified as a father-to-son message, but I came this far…no turning back. Most people with the exception of my African-centered, conspiracy theorist, Tea Party and apathetic folks will disagree and strongly rebuke me in the name of Jesus for this assessment of the President. Logically speaking when Black people debate the President’s position on the Black condition, both Obama supporters and the opposition use the argument that he is not only the President of Black America, but he’s the President of the United States. This is indeed the truth, but not because he has to represent all of the diverse cultures and groups in America, but because he’s a representative and the spokesperson for the powers that truly control our society. As a student of Pan-Africanism, the principle of colonialism within the U.S. isn’t farfetched. Clearly I’m writing too much, but it’s all necessary (in my own mind). The point is that if we don’t expand our thinking, grasp these ideas of colonialism and neocolonialism and apply them to our political theory, we will continue having these dead-horse-beating, reignited and tired debates over Obama’s position on “Black issues,” how he talks to us and the so-called “Black Agenda.” How’s that coming by the way?